Custom built home with perfect views of the New River. Hardwoods and tile throughout with granite countertops & tile backsplash in the kitchen. the master bedroom has a great view of the New River! The bathroom has double sinks and a huge walk-in shower with dual shower heads. Enjoy the fantastic view of the New River from the covered back porch or from the park-like setting of the yard below with approx. 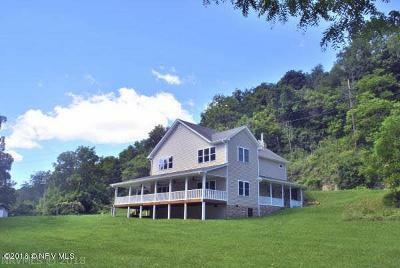 650&apos; of River Frontage with almost 2.4 acres of land! Home has room to expand and the land is dividable too! Call to schedule a showing today! Directions: From Radford, Take Rt. 11 Across The Bridge And Make A Left On Hazel Hollow Road. House Is On The Left. See Sign.